The TIME magazine has placed Malaysia as second most corrupt nation after Brazil. Mmm. Before you get excited, please remember that this is the same TIME magazine whose unsolicited advise to Barack Obama with regards to our PM Najib Razak was totally disregarded last year by the US President. In fact, Obama went on to visit Malaysia not once but twice! The same fledgling magazine that informs its shirnking readership that nasi lemak - yes nasi lemak! - is one of the healthiest breakfast meals they could ever have! We Malaysians love our nasi lemak but we know better. [Hard to digest it's healthy]. What the TIME is not likely to be excited about is despite all the bad press they and cousins WSJ and Sarawak Report have been giving us, there is plenty of good news. Our currency the dear Ringgit, for example, is making a quiet and strong comeback even as I write this! And the stock market's not doing too badly, either. You can follow the Ringgit's progress h e r e.
And our economy is not doing too badly, all things considered. The China Railway's RM8billion hub right smack at the centre of the much maligned 1MDB is a major and - pardon the pun - timely boost. Read also Uncertain economy no hindrance to affordable homes. Mediocre people will hail this as a great accomplishment. 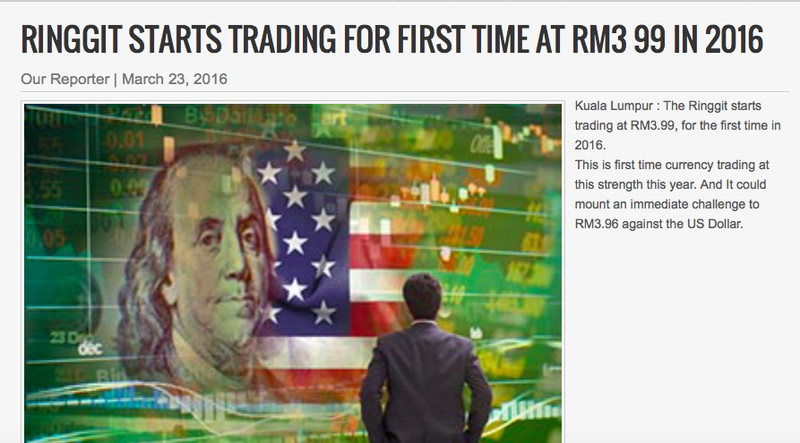 Forget the fact ringgit was traded at 3.20 early last year. For them 3.96 is a miracle. Forget also it was traded at 4.40 a few months ago. Why did it happen? Mediocre people will say: ringgit went weak because of external factors beyond our control. But ringgit is 'strong' now because of Najib. Your roti canai and ice milo is still more expensive than before but who cares? (1) Why would Obama want to listen to an advice by a magazine? (2) Why are you putting down our national breakfast dish? It can be healthy if all the ingredients are apportioned right. (3) Our currency, like every other emerging market's currency, is getting stronger due to the US Federal Reserve's stance of delaying their interest rate hike. It's still a far cry from the days of USD1 = RM3.20. Like it or not, we are still at the mercy of the United States. (4) China Railway is another example of China's soft power - invest in Malaysia while grabbing our sea sovereignty. Affordable homes are always welcomed no matter the economic conditions so that's nothing new. It's related to the price of oil with West Texas Intermediate at $41.45 to the barrel and Brent Crude at US$41.79 to the barrel and WTI is forecast to reach US$47 to the barrel in a year. I'm sure this news will disappoint coffee shop and teh tarik politicians, as well as sit-on-backside keyboard commentators who pin the low ringgit exchange rate on "1MDB", "RM2.6 bil", "Altantuya", "GST", "Rosmah's diamond ring", the leaking jamban next door, etc., etc., etc. -- well on everything else but the price of oil. In fact, recently, their silence on the ringgit rising above the the psychological RM4 to US$1 mark is deafening, especially since the ringgit's exchange value began to slowly increase since January 2016. The lesson for Malaysia here is to diversify our portfolio so as not to be so dependant on a single commodity or industry, however lucrative it may have been all along. Hope someone could go and sue TIME Magazine quick for the very damaging article. Yesterday I read at the bottom of TV3 bulletin that the sales of EDRA's IPP had somewhat strengthen the Ringgit too. Of course, "The China Railway's RM8billion hub right smack at the centre of the much maligned 1MDB is a major and - pardon the pun - timely boost." At the onslaught of the Ringgit depreciation (higher when compared with other currencies), Najib's cabinet adamantly stressed that 1MDB had nothing to do with it. But how come, when its "making a quiet and strong comeback", 1MDB gets the credit....err... a 'timely booze'? That rationalization plan to sell the IPP below purchase cost, must have been great. Haven't Dato Rocky ever wonder that Khazanah too, could have pulled off that CREC-RM8-Billion-hub feat, with Rakyat's prime lands and oher assets, intact? Has the ringgit improves against the Thai baht, Pesos, Rupiah and SGD? "Has the ringgit improves against the Thai baht, Pesos, Rupiah and SGD?" I did about two days ago and yes, the ringgit has appreciated against several major world and regional currencies.